Travelling from Alaska to New Zealand and Antarctica, Vlad Sokhin is collecting visual evidence on the impacts of man-made global warming – from coastal erosion and rising sea levels to thawing permafrost and changing weather patterns. Climate change is now considered to be the most pressing environmental crisis in human history, threatening not just the very existence of low lying communities but ultimately the sustainability of even the most established economies. Climate change is not a problem for future generations anymore – it is a present and immediate crisis that needs to be addressed to forestall catastrophic consequences. 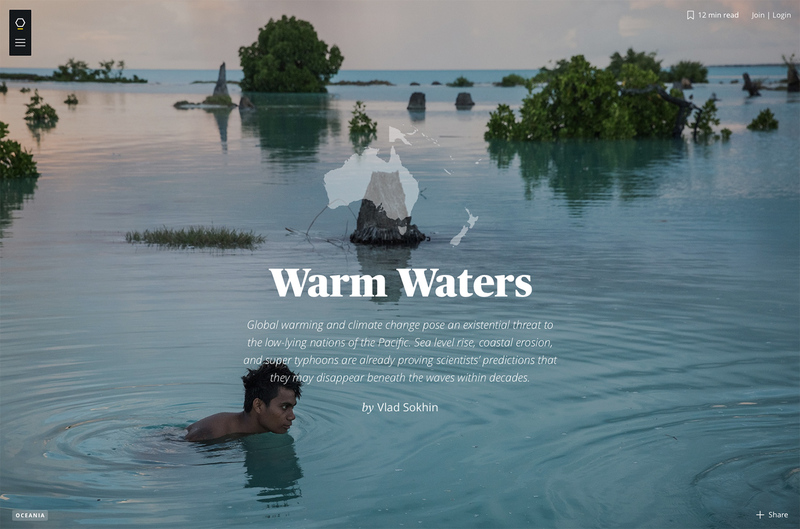 Over the course of his extensive project covering the Pacific, Vlad Sokhin aims to cover the entire region including Papua New Guinea, Kiribati, Tuvalu, Tokelau, Vanuatu, Fiji, the Marshall Islands, the Federated States of Micronesia, Guam, Palau, Samoa, Northern Mariana Islands, Niue, Solomon Islands, the United States of America, Russia, Australia, New Zealand and other territories.